James Morris Willcox, Chapel Street, Warwick. 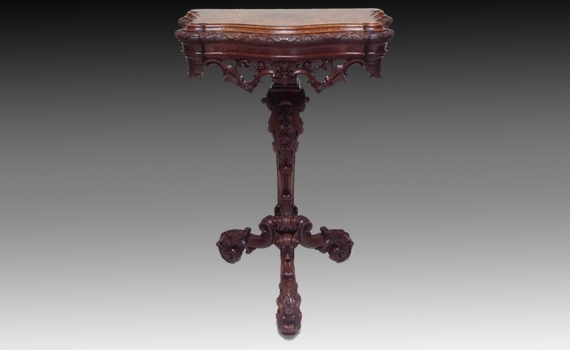 A mid 19th century pollard oak and carved oak console table. The serpentine shaped top with carved border and veneered with pollard oak, above a moulded frieze, with pierced carved apron, standing on a cabriole form support with three ‘S’ scroll legs. The whole finely carved with acanthus scrolls and flowers. Retaining two paper labels for J M Willcox.